I have mentioned this project in a few of my previous projects. This was my first woodworking project. 5 years ago, my wife and I bought a new house. Due to the upgrade in square footage, I was gifted a man cave by my wife. In reality, I think that it was really for her. Now, she had a place to send me when I got on her nerves. Anyway, the furnishings of my man cave were initially leftovers from our stuff that my wife did not use in the decorating of the rest of the house. I had my tv, DirecTV and my gaming systems, and I was pretty happy. One day, I got the wild idea that I wanted to really make my man cave a REAL man cave. I wanted decor that really made it mine. I searched Amazon and local purveyors of fine goods, but nothing really grabbed me. I decided that I would attempt to build my own centerpiece. I am a big fan of “The Walking Dead.” I wanted to include something that coveyed my interests. I decided to build an “In Case of Zombies, Break Glass” box. As I have mentioned previously, I undertook this project with basically no tools and certainly no knowledge of basic finishing techniques. I constructed the box from 2×6s. The back is 1/2” plywood. The glass is plexiglass that is shoddily mounted to the back of the door. For illumination, I bought a simple light fixture from a big box store. I ordered the In Case of Zombies decal online. I had seen some In Case of … boxes online, but I wanted something unique. What is more Walking Dead than a crossbow? I ordered a cheapish crossbow from Amazon. I also included a small machete, knife and demo bar. I used Minwax polyshades- stain and poly in one – to stain the wood. I did not sand ANYTHING. EVER. You don’t have to get close to see the terrible finish on this project. I have kicked around the idea of redoing the project. Changing the background to better see the decal and giving it a better finish, but I have – for now at least – decided against it. First, I kind of like the feel that the roughness gives the box. Second, I like the reminder of how far I have come and the reminder of what happens if I don’t take pride in finishing. This was the beginning of my addiction. This was my gateway project. I think that had I known what it would lead to, I would have done it years earlier!!! Hey PBW, great first project. .... I have kicked around the idea of redoing the project. Changing the …..
Be logical and realize when the zombies attack… who’s gonna give a crap as you’ll probably never break the plexiglass to avoid the bite! Good work on your first project PlanB… funny name but never the less good just the same. 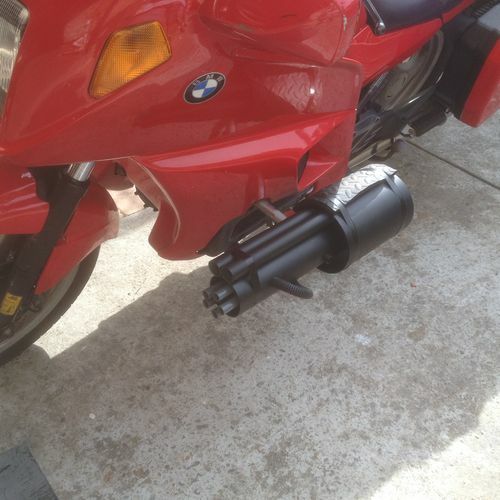 I made a Zombie gun for my motorbike just in case some decide to attack from down south! Crossbows are cool! Love the idea and a great conversation piece. Thanks for sharing. This is an eye catching shadow box.